Caroline Snow of the Merkinch Local Nature. Come and enjoy our best-kept secret- that’s the message from a group running a wild green space at the heart of one of Inverness’s most deprived areas. Merkinch Local Nature Reserve (MLNR) is yards from ‘the Ferry’, an area of the city long linked to poverty and crime. MLNR’s new project manager Caroline Snow has been inviting the local community to drop-in sessions to find out what they want for this hidden gem on their doorstep. Extending west along the Beauly Firth from the old Kessock ferry ticket office, MLNR boasts sea shore and mud flats, pools, swamps and woodland. Caroline says dolphins regularly swim by and she has even seen a humpback whale and pod of pilot whales. Otters can often be spotted, along with herons, terns, oyster catchers and there are regular reports of an osprey flying over in the afternoons. She said: “There have also been sightings of a sea eagle. Turning away from the shore, the reserve has woodland approached through two grassy picnic areas where swallows swoop and finches flit from tree to tree. Roe deer live in the woods and a kingfisher has even been spotted at the far end of the 55 ha reserve. 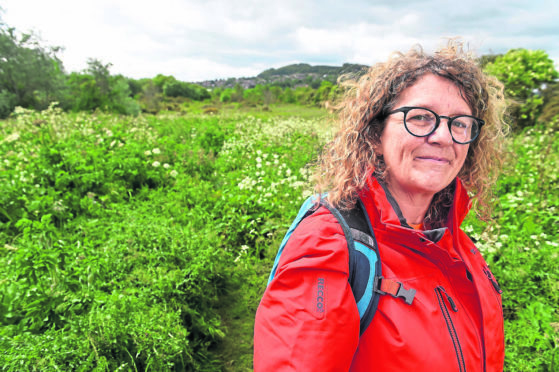 Caroline’s three-year post, funded by the Big Lottery, involves engaging with the Merkinch community, encouraging them to visit the reserve and finding out how they want to use it. She said: “We had our first drop-in session this week, and people came up with a lot of different ideas. “The most negative thing I heard was someone didn’t like the amount of dogs running round and they felt slightly threatened by that, so we’re planning to encourage responsible dog ownership. “But there were lots of positive things, people asking to find out what species live here, what wildlife, what trees and so on. Caroline’s own programme of events for MLNR include a kids’ club every Friday throughout the summer, some joint projects to look at moths and butterflies with countryside ranger John Orr, and evening surveys of bats. She said, “We’ll also be doing guided walks to tell people what lives here and grows here. “In August we’ll have an astronomy night with local mathematician and astronomer Stephen Mackintosh.